Most internet users rely on service providers for their cable modems. It is not something you can do without and this is something most internet providers take advantage of. If you want to avoid paying ongoing monthly rentals, you will love our Top 10 Time Warner Cable compatible modems. 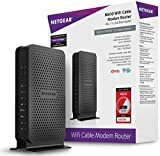 The Nighthawk from NETGEAR gives reliable and stable connectivity with DOCSIS 3.1 certification and compatible with Time Warner. It is ten times faster than the previous DOCSIS 3.3. Users can connect to four data using devices simultaneously for HD video, gaming etc. with four Ethernet ports. It offers good security features, connection, firmware updates and excellent functionality too. The maximum download speeds are 1.4Gbps for high-speed gaming, video streaming, and download. It is an affordable Time Warner modem that is 32 times faster than a DOCSIS 2.0. You easily connect it to your computer or router. The CM 500 is compatible with Time Warner with its DOCSIS 3.0 certification. It has a great design in all-black with gloss plastic with a smooth, slick appearance. In upward mounting capability, you can place it anywhere with its small physical footprint. Its design with passive venting at its top, cooling vents along the bottom, prevents overheating. A variety of LED indicators tells you when it is turned ON, when it gets too warm, upstreaming and downstream information, whether it is synchronized with the service provider and when it is busy with traffic processing too. The CM500 comes with a one-year warranty. When you are a Time Warner cable user you save on rental fees when buying the N450. This dual function device has four Ethernet ports and two USB ports, as multi-function Wi-Fi router and Cable Modem. Excellent for high-speed gaming, fast downloading, HD video streaming and working. If you want maximum performance us it with an N900 adapter too. The CM400 is compatible with Time Warner and various other providers. Users with Time Warner cable using plans up to 100 Mbps will find it a good choice. Offering 8 times the download speeds of a DOCSIS 2.0 it also supports a one Gigabit Ethernet port. 4 downstream and 8 upstream channels give you reliable and efficient access. This device is a three-in-one 2Gigabit wired switch + AC 1600 Wi-Fi Router and DOCSIS 3.0 Cable Modem. This Netgear gives you an excellent all-round package at a great price. It offers 16×4 bonding and speeds up to 300Mbps. It also has dual-band capability of 2.4 and 5GHz. The NETGEAR offers great value as top Dual Band router with long range and fast wireless performance. It comes with additional features like USB external hard drive, traffic meter, network storage guest zone, and more. On both 2.4 and 5GHz, bands are an excellent range. Eight different LED Indicators tells you exactly what you need to know, this includes blocking unsafe applications and internet connections. Excellent for home streaming, gaming, working, Internet telephone calls and more. The ARRIS SB6141 offers fast internet speed with DOCSIS 3.0, four upstream and eight downstream channels. Data rates are 131 Mbps for uploading and downloading of 343 Mbps. You will enjoy efficient, fast and realistic speeds during all networking applications like video conferencing, working, downloading, shopping, gaming, and HD video streaming. Everything you want from a good modem is what you get with the Motorola. Various internet service providers including Time Warner certified and easy to set up. Advanced lighting and surge protection excellent customer support and high speeds are some of its best features. Warner Cable and many other ISP’s are compatible with the TC-7610. Comprehensive network capability with its DOCSIS 3.0 that allows for backward compatibility to DOCSIS 2.0, 1.1 and 1.0. Using Gigabit Ethernet, you have lightning-fast HD streaming and online gaming. You connect the TP-Link either using an F-connector or directly to your router or computer.